A fun night was had by all at our recent Digital Leaders Awards. In case you missed out, here’s a quick rundown of the evening and here’s a link to photos. I hope it whets your appetite to get involved in organizing the 2018 event. CTN welcomes all participation, whether it’s simply nominating a worthy winner or helping to shape the future of the event. Brian Roberts won the Digital Champion Award for, among other things, his service to the SF Connected program. Jared Boddum, CTN volunteer, was presented with the Digital Changemaker Award in recognition of his 400 hours of service to the Chinese-American community. Tiana Wertheim collected the Digital Bridge Builder Award on behalf of the SF Human Services Agency, which is pioneering community health online applications. Scott Adams from Comcast accepted the Digital Amplifier Award, which recognized the importance of the Comcast Internet Essentials program. Carol Varney and Josh Peters of Bay Area Video Coalition received a Digital Inclusion in the Community Award for contributions to workforce development. Villy Wang and Katie Cruz of BAYCAT were honored with a Digital Inclusion in the Community award for their organization’s youth development work. Marie Jobling of Community Living Campaign accepted a Digital Inclusion in the Community Award for services to older adults. 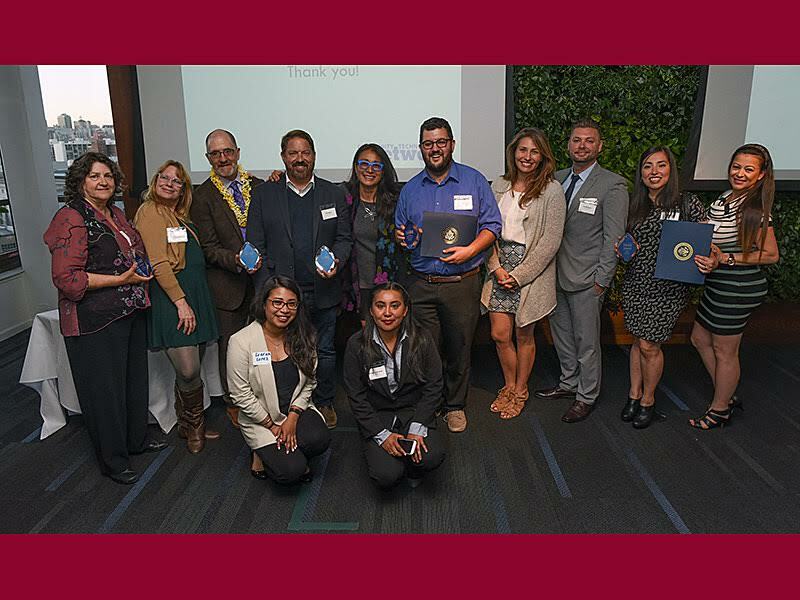 Tania Estrada from the Women’s Building also collected a Digital Inclusion in the Community Award for services to the immigrant and undocumented community. Our special guest, Jason Robinson, the vice president of product at Juvo, kicked off the evening with an address. This was followed by the awards and a silent auction that included such treats as a winery tour and SF Giants game tickets. The rest of the evening was dedicated to good food, fine wine, and chatter between old friends and new acquaintances. We hope you will join us for the Digital Leaders Awards 2018, not only on the day of the event but also on the planning committee. We want this to be a collaborative event that grows into the biggest celebration of digital inclusion in the nation! If you represent an organization that would like to become an event partner, or you’re a keen individual with something to offer the event, send an email to DigitalLeaders@ctnbayarea.org.